In the anime series "Mobile Suit Gundam", Principality of Zeon has declared independence from the Earth Federation. Zeon, though smaller, has the tactical upper hand through their use of a new type of humanoid weapons called mobile suits. Graham Aker is an antagonist of the series wears a mask to cover scars and appears under the alias of Mr. Bushido. I was commissioned both masks of Mr. Bushido from the anime Mobile Suit Gundam. I decided to use Apoxie Sculpt (epoxy putty) to sculpt the mask master. I used this air-dry putty over clay because my sculpting skills aren’t good enough to produce a finish smooth enough to simulate metal. 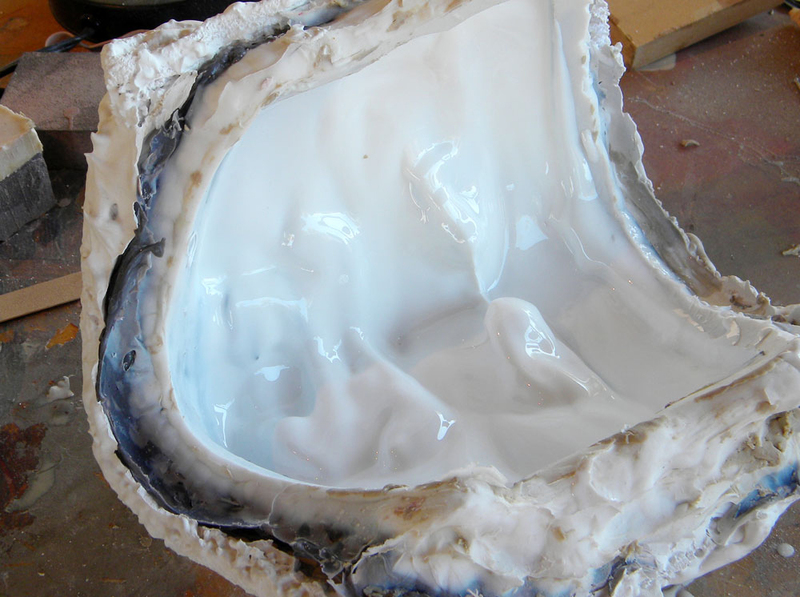 The dry putty can be carved, Dremeled and sanded to a smooth surface before it is molded. Since Apoxie takes a few hours to dry, I used Bondo to correct geometry and reshape features to make the mask symmetrical. 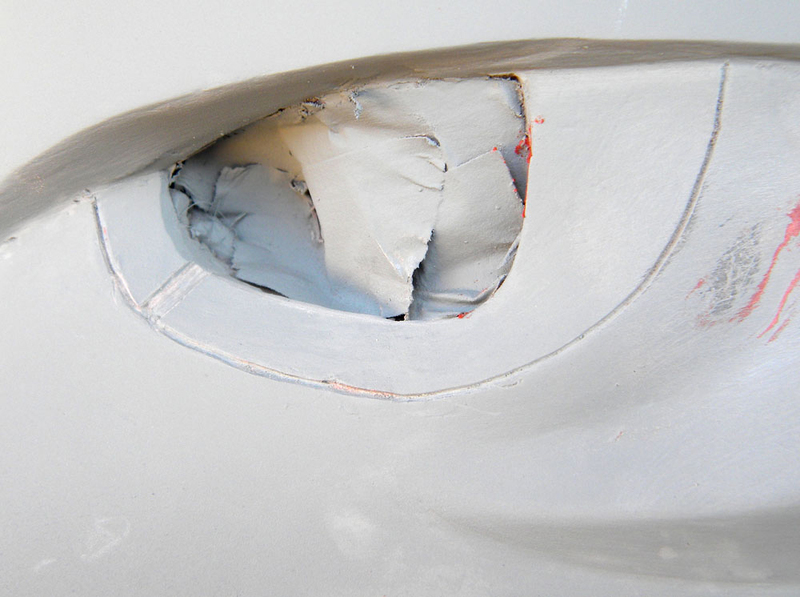 You can see from the pink Bondo areas how much had to change from the Apoxie stage to get to final sculpt. 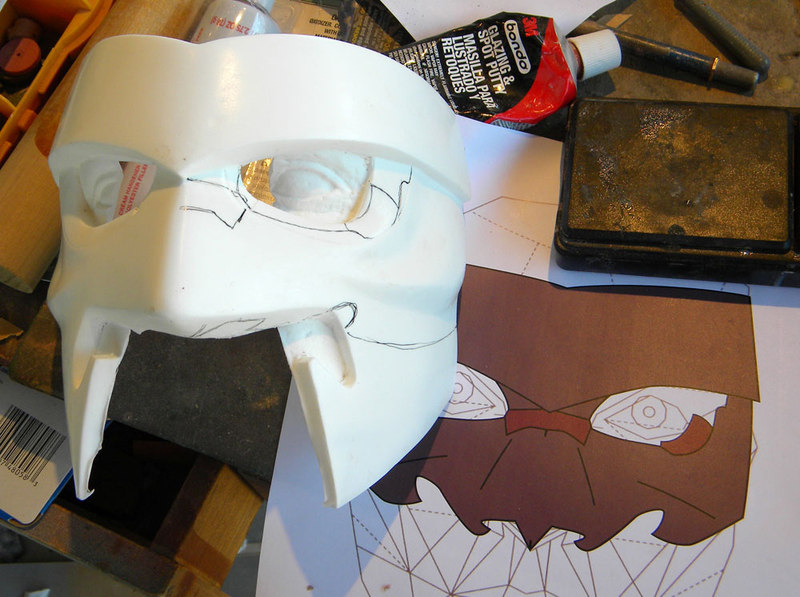 I gave the mask several thick coats of filler primer to smooth out the surface and point out any imperfections. To further define the bevel around the eyes, I scribed a thin line around the color break. The final mask ready for molding. 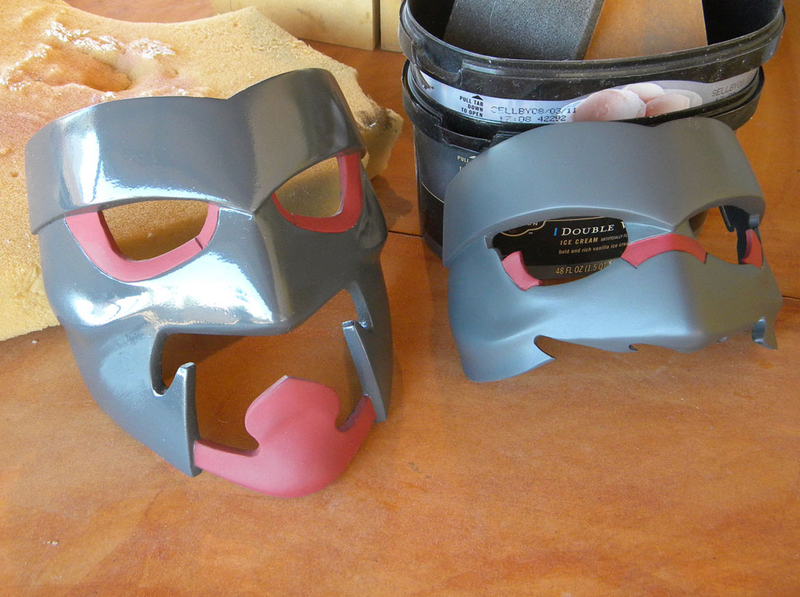 I used Smooth-On Stroke to build a thick silicone mold over the mask. 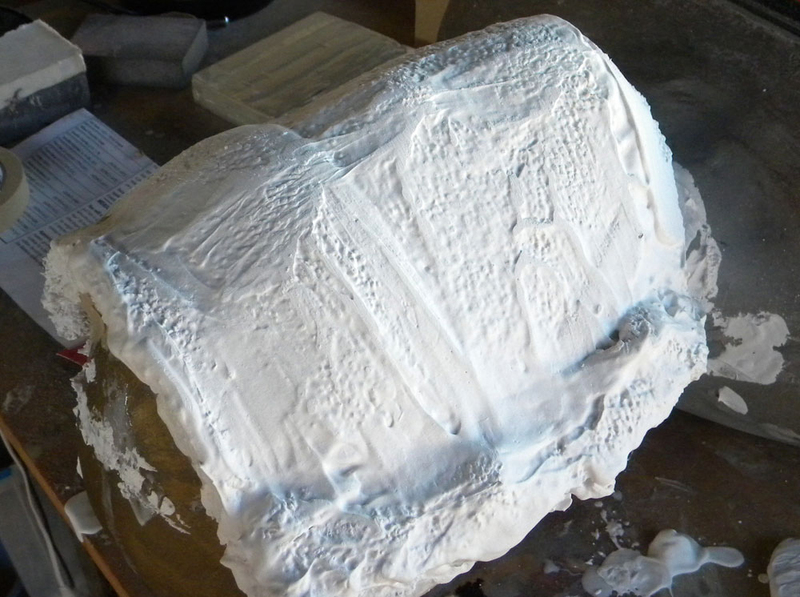 The stuff goes on like cake frosting and allows you to quickly build a stable mold wall. I soaked a cheap shop rag in plaster to make a mother mold over the silicone so that the mask can retain its proper shape. The cured mold pulled off the master. I poured some Smooth-Cast 65D (formerly Smooth-Cast Roto) and slush cast the mask in several layers. 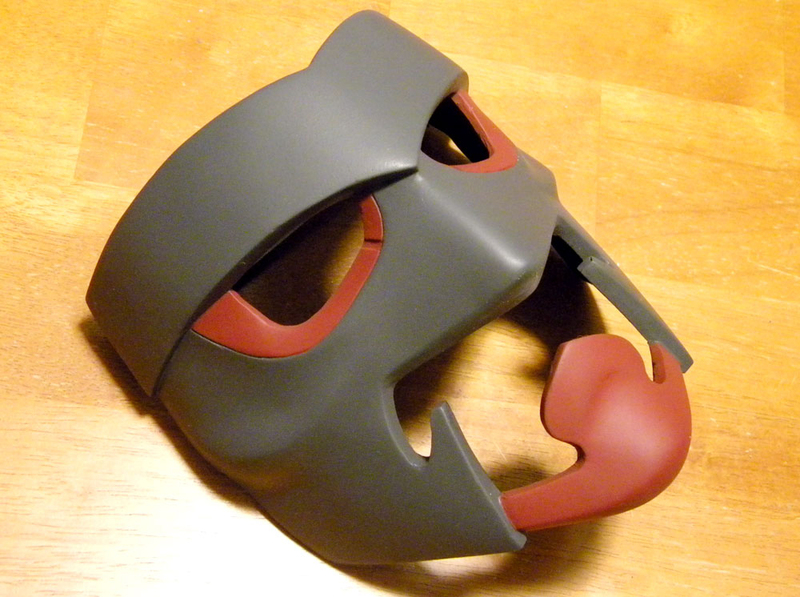 The de-molded mask! A perfect copy including my eyes and mouth. For the half mask, I cast a second copy and marked where I’d need to change it. The half mask with excess cut away and the scribed lines filled with putty. To attach straps to the mask, I bought some bathing suit hooks. 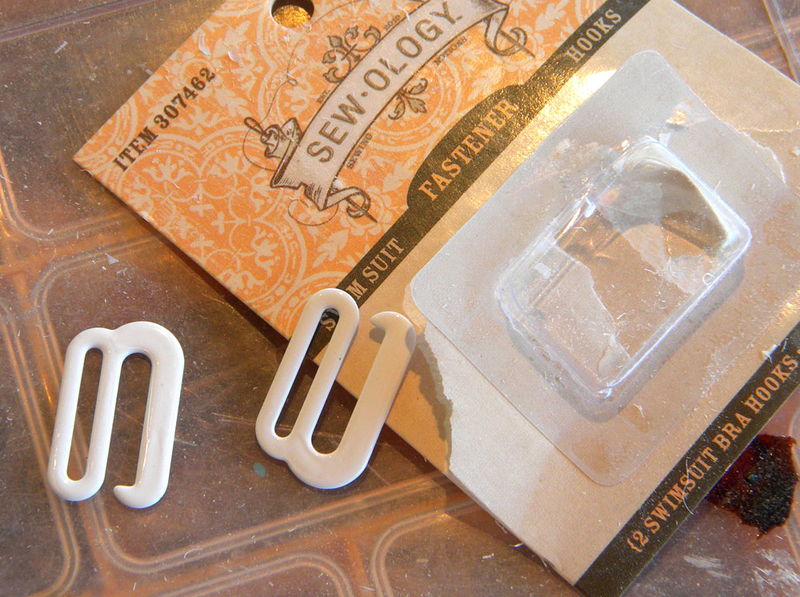 Tacking the hooks in place, I poured a small amount of resin in the corners to lock them in place. A base coat of gloss grey. 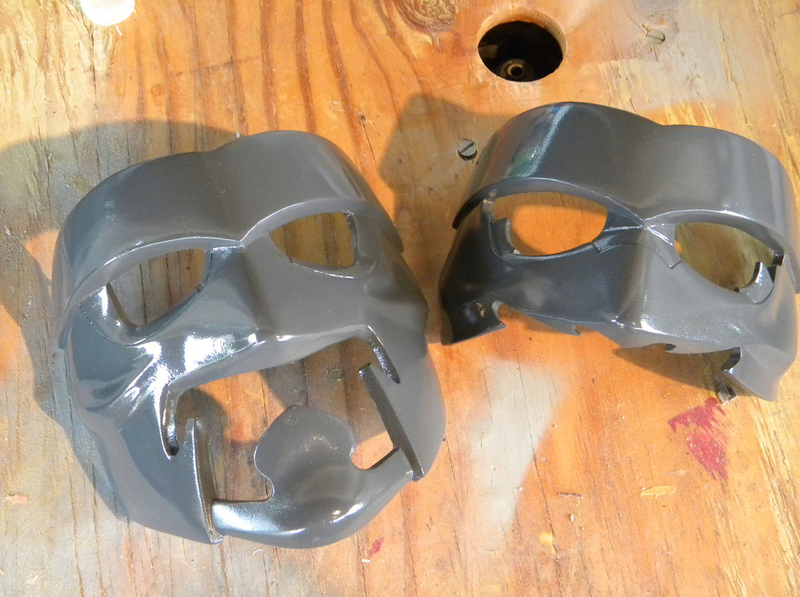 I painted the inside of both masks with flat acrylic black paint. After the red areas were painted, I applied a protective coat of matte finish Crystal Clear. The half mask here shows can see how much of a difference the matte finish makes.